Layered navigation is a significant point in building a website especially when you suggest visitors extensive product catalogs with a lot of attributes. Imagine how long a customer should search a desired product with particular color or a size during browsing your website. It often happens that users give up a page. You lose customer, you lose a sale. After all you don’t want this, right? In previous post we have promised we’d discuss Magento layered navigation in your store. Continue reading to know how to enable filter products on category page and get customers engaged in more convenient purchase process. 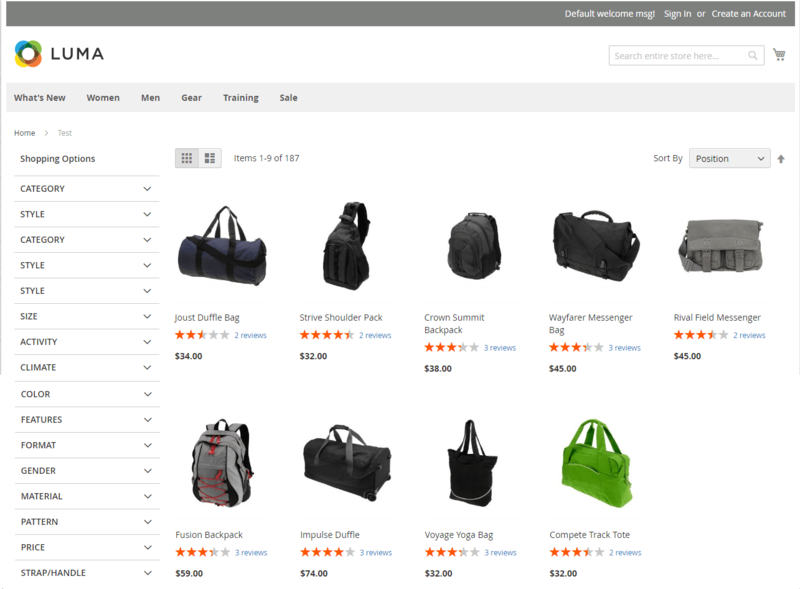 We will also show you Magento website samples with built-in layered navigation. You can follow links and try search a product in few clicks. Perhaps you already know, that a layered navigation, in other words product filters, can be displayed on anchor category and on search results pages only. In order to show a layered navigation with filterable attributes on your store pages you have to go through the steps shown below. Create Attribute that will be used in layered navigation. Assign attribute to relevant attribute set. Create a product based on this attribute set. Enable layered navigation to category you need. Product filters are dynamic. Each option of the filter is correlated with a product. For instance, if you want to show a color filter in layered navigation block, you should assign a color attribute to the product in current category. There are 3 attribute types that can be used in Magento layered navigation: dropdown, multiple select and price types. You can’t change the attribute set for the products after creating that. Go to Admin -> Catalog -> Attributes -> Manage Attributes. Click Add new attribute. Fill out all fields in the Properties fieldset. Save. Set the attribute to be used in Layered navigation. You can choose between Filterable (with results) and Filterable (no results) values. Define a type for attribute. You can choose from Dropdown Menu, Price Type and Multiple Select. Set the type in Catalog Input Type for Store Owner field. Please remember that you may not change it later. Select Yes in Use In Search Results Layered Navigation field. Using Label/ Option tab you can add as many values of the attribute as you need. Go to Catalog -> Attributes -> Manage Attributes sets. You will assign an attribute to the attribute set. Click Add new set. Fill the fields and save. Now you can see the created attribute set. Move your new attribute from Unassigned attributes to the group you need. Save. Please add a product in Catalog -> Manage Products. You can see the attribute set drop down, where you may select the one you’ve created before. Press Continue. Go on creating a product based on new product attribute set. Choose attribute value for product. Save. Now you’ve got a possibility to filter a product list based on its attributes. This will help you to make a navigation at the website more user friendly. Your customers will search products by available product attributes like color, size, style, price, brand, material, category, etc. That’s the way the layered navigation is. Following best Magento practices for customer engagement, we consider most popular requests related to layered navigation. As usual, the information will be shown separately for Magento and Magento 2 versions. By default the block with product filters is displayed in the left column. However you can show the layered navigation on the top. The last thing you need to do is to modify the vertical layout to horizontal with CSS. Go to Admin - Products - Categories - Select Category - Design Tab - Layout and choose 1 Column. Now you can see the layered navigation placed at the top in content area. Go to Admin - Products - Categories - Select Category - Design Tab - Layout and choose 2 Column Right. Now you can see the layered navigation placed in the right sidebar. By adding Magento color swatches to the category layered navigation you will allow the customers choose a desired product by color. This will speed up the purchase and improve the overall user experience. Go Admin - Catalog - Attribute - Manage Attributes. Add new attribute. Select Manage Label / Options tab to add your attribute values. Navigating Catalog - Attribute - Manage Attribute Sets you will create a new attribute set. You will see newly created attribute Color there in Unassigned Attributes column. You have to drag it to the left column. In the latest releases of Magento Community and Enterprise editions, color swatches are now available within Magento’s built-in functionality. So, please go System - Configuration - Configurable Swatches and enable the feature. Choose attributes you want to show as a swatch. You’ll also get the predetermined swatch sizes used for the layered navigation. In order to show the swatches in layered navigation you have to start with global swatch images (/media/wysiwyg/swatches) with the same name as the Color attribute label. Now you have 2 ways to get an image for the swatch. First one is to create a PNG image, that will match a label with a file name. Use all lowercase letters with hyphens. You have to copy the image to media/wysiwyg/swatches. Or you can open CMS – > Pages - Home Page - Content tab - Insert image, and upload your image to the swatches folder. 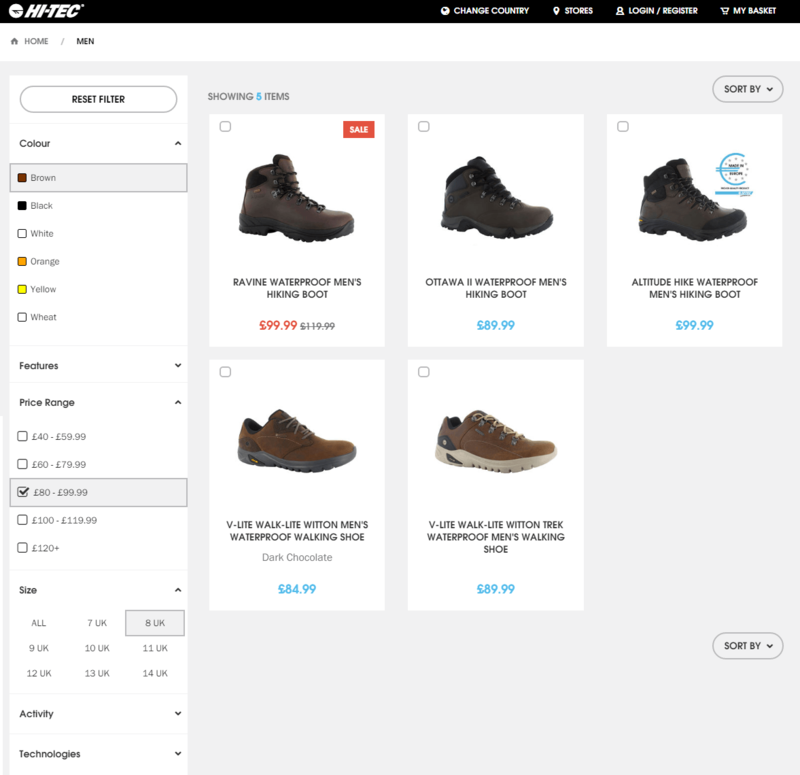 After that go Catalog - Manage products and apply new color attribute to the new created product or to existing one. Go Admin - Stores - Attributes - Product. Find a Color attribute and edit it in Attribute Properties tab. You can add a color swatch or upload a swatch image. In Manage swatch grid you can click on swatch icon and choose a color you need. You can also collect a few color swatches for your product. Save the attribute. Go to Admin - Products - Inventory - Catalog. Mark the products the swatch should be applied to. Then choose Update attributes in Actions field. Navigate to Color field and mark the Change checkbox. Choose a color and save. Don’t forget clear a cache. The CMS page layout should be “2 column with left bar”. In that case you will see a layered navigation block at the very top of the left column. Please note, the<category_id>2</category_id> is root category id. Finally you have to set Is Anchor to Yes for root category in Catalog > Manage Categories > Default Category > Display Settings > Is Anchor. Save. That’s it. Now you can see a layered navigation block in the left column. In order to apply filters you have to create any content on a CMS page. By adding the following code you will show a products listing, in other words you will create a category page within a CMS page. By default the CMS page layout should be “2 column with left bar”. After adding the following codes you will see a layered navigation block at the very top of the left column. Well, you see that the layered navigation looks great anywhere in a store. You can place layered navigation filters through you efforts by following all steps mentioned above. However there are also other approaches which will help users find a product much faster by product categories and product attributes. In fact, you can improve a navigation with just a few clicks. Magento layered navigation extensions will be useful. We're going to consider 5 famous online stores built with Magento, which use the layered navigation in different ways. You can follow site samples in order to choose the most friendly navigation approach for you. Bulgari was founded as a jewelry shop in 1884. This is an italian company that was bought by French luxury group LVMH in 2011. Since that time the company keeps designing glamorous gemstone jewelry, luxury watches, perfumes and leather staff. 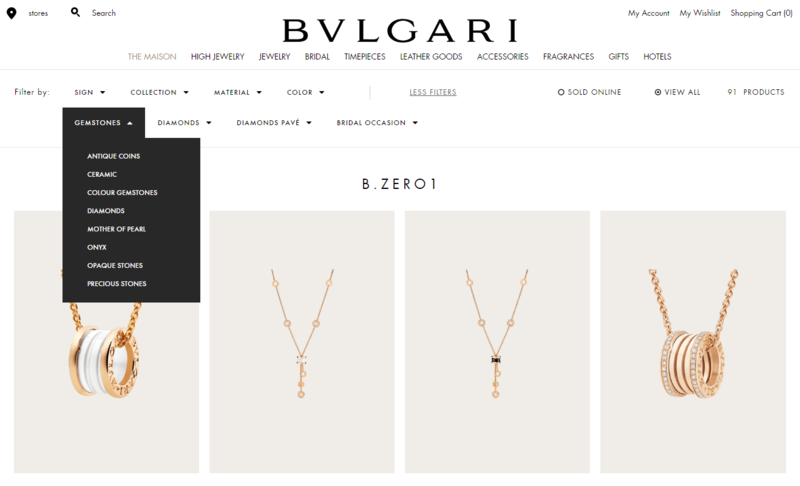 While selling goods online Bulgari prefers to use a top layered navigation. Probably they reckon that the top navigation items are more visible and easier to find. There’s an implicit rule that the navigation shown at the top is accompanied by the header and logo - the most catchy elements on a web page. So, the Bulgari idea is to show layered navigation on the top. The St.John idea is to show the products availability in numbers per each attribute. 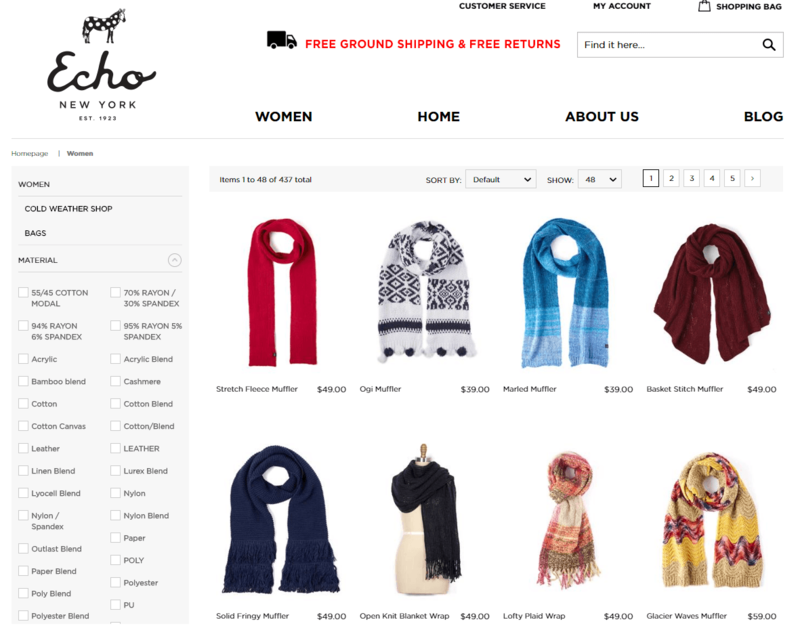 Launched as family business called Echo Scarfs, the Echo company keeps working as a fashion store for woman in New York. Everyone can choose the luxury silk scarfs, hats, gloves, swimsuits, etc. Given the fact that the Echo goods are made out of various types of fabrics, the online store is using a layered navigation in order to help visitor make a decision faster. The Echo idea is multi-select in other words the display of as much filters for the same attribute as it has. Selling goods more 50 years, the Paper Chase company is still a leader in innovative, design-led stationery, cards and gift-wrap. The company was established in the UK, but you can find the excellent products in one of the stationery stores placed in Europe and the USA. Once visiting a Paper Chase website, you will be impressed with lots of vibrant colors everywhere in the store. You can see brightly colored header, call-to-action buttons, labels. However we'd like to focus your attention on the layered navigation block background highlighted with different colors. The Paper Chase idea is is to customize both the background and attribute filters to make them highly visible. This is good method to help customers focus on required product option quickly. If you are passionate about footwear, go along with Hi-tec company. Being found in England in 1974, the Hi-tec was expanded to more than 80 countries worldwide. You will meet over 500 Hi-Tec styles well known as the Hi-Tec Outdoor, Hi-Tec Court, Hi-Tec Golf, Hi-Tec Sport, Urban collections and Magnum brands. It goes without saying, that the website is friendly throughout. Look at the highlight the Hi-Tec is using to improve the layered navigation. The Hi-Tec idea is to make reset filters button visible in the top. This small improvement will help users clear all filters easier and faster. Ajax Layered Navigation by Templates-Master team enables layered navigation all around a store in a single click. The module supports 3 Magento menu: classic, horizontal and vertical drop-down. There are different types of attribute options display: images attributes, checkboxes and drop down. 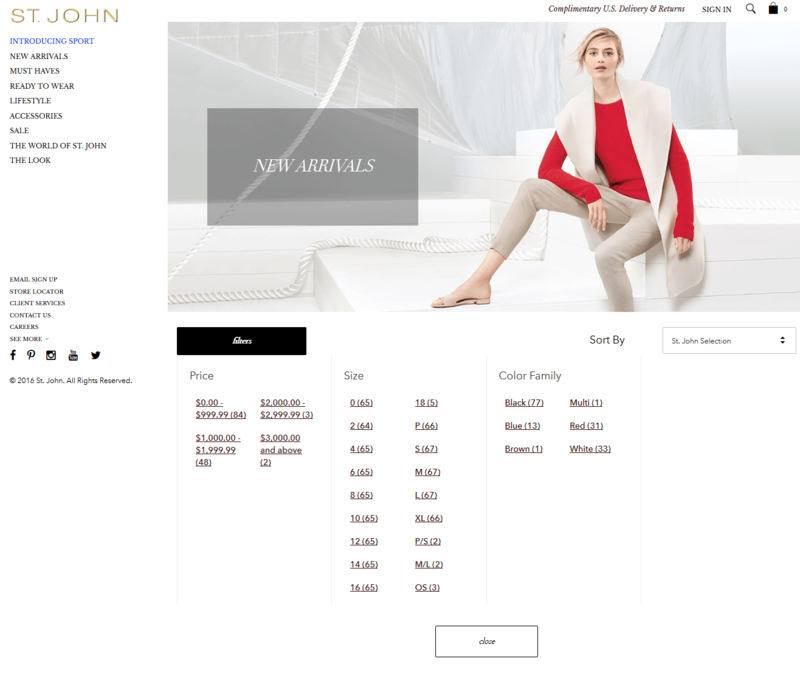 Allow users shop by brands, color, price range available in the layered navigation block. You can also assign the layered navigation price ranges individually for each category. Magento Layered Navigation extension allows you to show categories in dropdown, together with subcategories or static 2-level category tree with plus/minus controls; hide or move category filters; exclude any categories from layered navigation. There are many options to display filters: check box, radio box, range slider for price. Magento Layered Navigation Pro module allows you to enable the layered navigation both on the homepage and category pages in your store. You can use images instead of text within the navigation for more visual browsing. The module also allows you to show the price as a slider, a range or an input field. Ajax loading feature is supported. Layered Navigation module by Extendware allows you to choose 3 different price filter controls: default Magento price selection, slider control price selection, input range price selection. The module is fully Ajax powered. Using the default Magento 2 layered navigation you can show only a block with categories on anchor category and on quick search results pages. The users can choose select the one only attribute at a time. This is quite embarrassing. In addition this is unprofitable for larger websites which are offering big catalogs of products with numerous attributes. So, if you want to ensure good customer experience in your store, it would be better to try out layered navigation modules developed for Magento 2. Our first choice for the best layered navigation in Magento 2 version is Ajax Layered Navigation module. In addition to improving the navigation with categories and subcategories filters, the extension allows you to show price attribute slider and apply multiple attributes to the same filter. Ajax loading of search results is supported. The layered navigation block is mobile-friendly. Improved Layered navigation for Magento 2 module provides customers with friendly browsing process in a store. 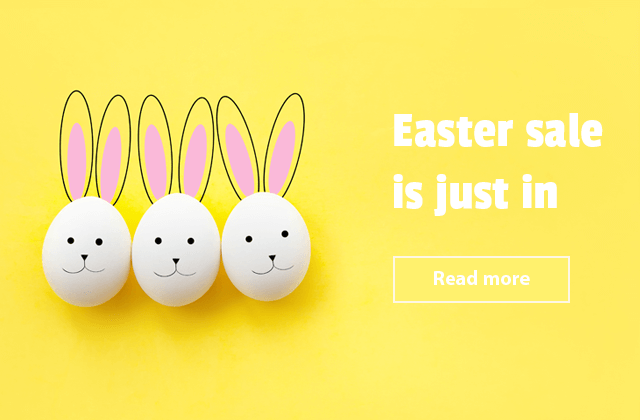 The extension allows you to use sliders and widgets for attributes, set up multiple navigation filters, group products by brands and create custom brand pages. 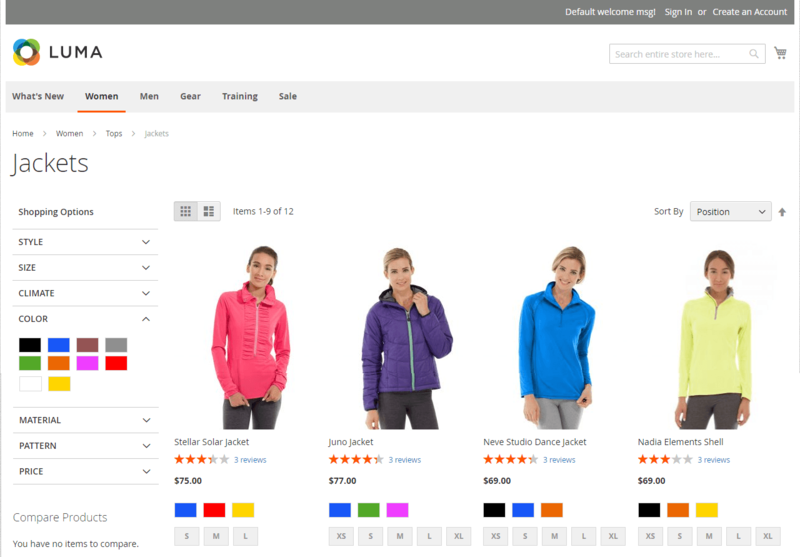 Layered Navigation for Magento 2 module makes the layered navigation block available both on catalogue pages and on search result pages. The highlight of extension is 3 new filter options: new, discounted, in-stock. 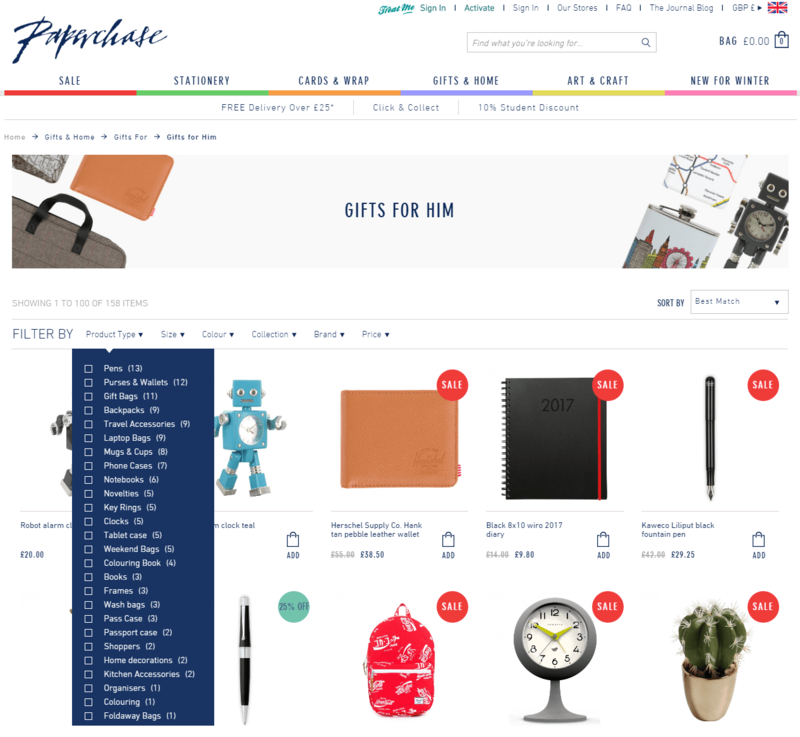 This helps customers categorise and find products easier. Among other nice features you can see a popover with result count. Magento 2 layered navigation extension supports Ajax loading feature and short SEO friendly URLs creation. What makes the module different is a price slider with various styles: Flat UI skin, Modern skin, HTML5 skin, Nice white skin and Simple dark skin. You can customize a slider look to make it fit your website design perfectly. Many clients come to us asking how we can help. Hope, we’ve helped you in understanding the basic of layered navigation functionality. What is that what we want to say else? The secret of success either navigation at your website or customer satisfaction is for you to be ready for improving when solutions come. Don’t wait. Start using our tips today. Go through the way of implementing ideas and let us know in comments. nice tutorial about layered navigation, but I had some problems. I have a custom brand pages, where I have a widget with condition to show if manufacturer attribute is LLLL show only them. How to add layered navigation to that page, only with attributes in layered navigation to match existing ones. At the moment it shows also not relative attributes in layered nav list. Hi, please let us know if that is custom module or module from any Magento extension provider? Usually layered navigation integration should be added to custom brands extension. There is no easy way to do that without taking look into your extension code. Great Tutorial . But i have follow this steps. My product listing page the show layered navigation but the color swatch is not showing. Great Post but sometimes too many expanded attributes under layered navigation doesn't looks good. If there is any way to make all or some of the attributes collapsed under layered navigation than please guide.